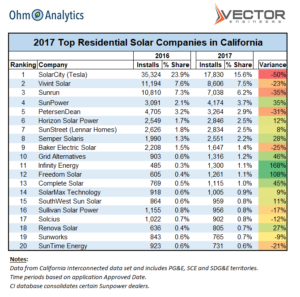 Ohm Analytics has published the list of the Top 20 Residential Solar Companies in California based on 2017 installation volumes. 2017 was a difficult year for rooftop solar, particularly in California where the market declined by approximately 25%. The decline was primarily driven by strategy changes at Tesla, a market dynamic which also created an opportunity for small and medium-sized installers to gain share. After a difficult year in 2017, the Top 20 Residential Solar Companies are well-positioned to benefit from a return to growth in 2018 as well as several long-term positive developments. Ohm Analytics’s Q1-18 data indicates that permit volumes in California increased by 14% in Q1-18 vs. Q1-17 driven by an increase in consumer interest in storage and a strong housing market. In early May, the California Energy Commission approved a new policy to require virtually all new homes in the state to incorporate solar panels in 2020. Analysts estimate that the policy change will increase the residential solar market in the state by more than 50%. At the national level, an 2018 NREL study noted that the annual potential for installing solar at the time of roof replacement/installation in the United States is 3.3 million homes or more than 10 times the current residential solar market. The recent development of rooftop solar shingles by Telsa and other vendors could be the tipping point to capture a portion of the roof replacement market opportunity. Lastly, some industry executives have compared the current state of the rooftop solar market to the Innovator Stage in the Diffusion of Innovation Technology Adoption Curve, which would imply a 5x increase in the market in the next stage of Early Adopters. 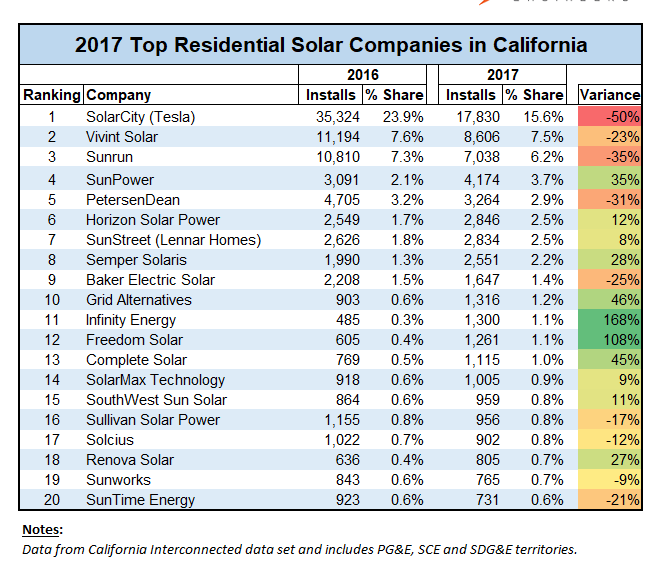 The Top 20 Residential Solar Companies is based on 2017 installation volumes from the NEM Currently Interconnected Data Set, which covers PG&E, SCE, and SDG&E territories. The list is part of Ohm Analytics’ Solar Contractor Database, a sales and channel management tool that covers over 4,000 solar companies in the U.S. Ohm Analytics tools are used by solar financing companies, distributors, and software/service providers. The release is sponsored by Vector Solar, an engineering services firm that prepares structural certification letters, an integral part of the package that is required to get a building permit in many U.S. solar markets. 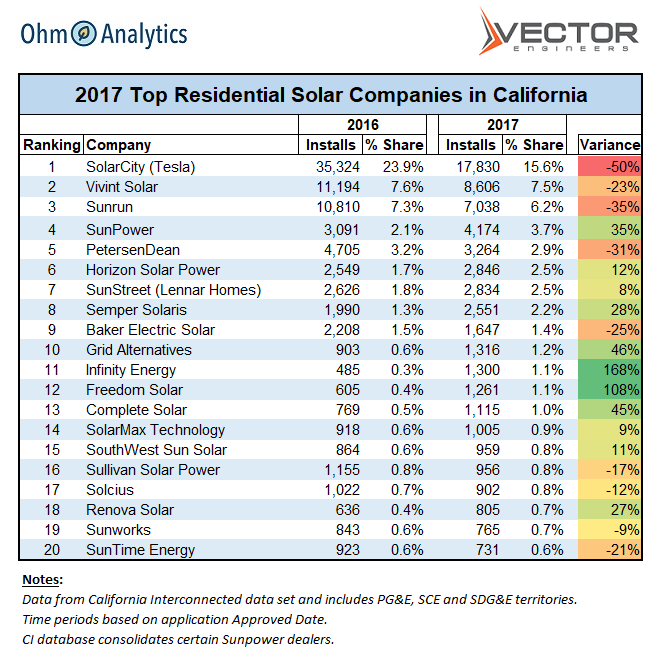 Vector recently surpassed the 50,000 project milestone and will be sending more information on its services to the Top 20 Residential Solar Companies in California (read more on Vector Solar’s services).